The world spent $563 billion on advertising this year. By contrast, we spent $9 billion on customer care. That means brands spend 98% of their time and resources trying to find customers, and only 2% actually taking care of their customers. In a world where customers are connected, empowered, and in control, brands need to rethink what’s important. Customer care, once the begrudged “cost center,” is becoming a top priority. To survive (and ultimately thrive) in this new world, brands need to rewire their customer care function. 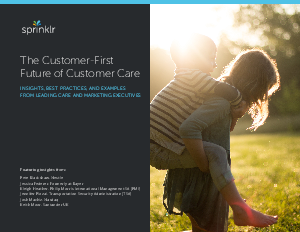 In this whitepaper, Sprinklr partners with leading customer care executives to discuss the role of people, process, and technology in driving change.